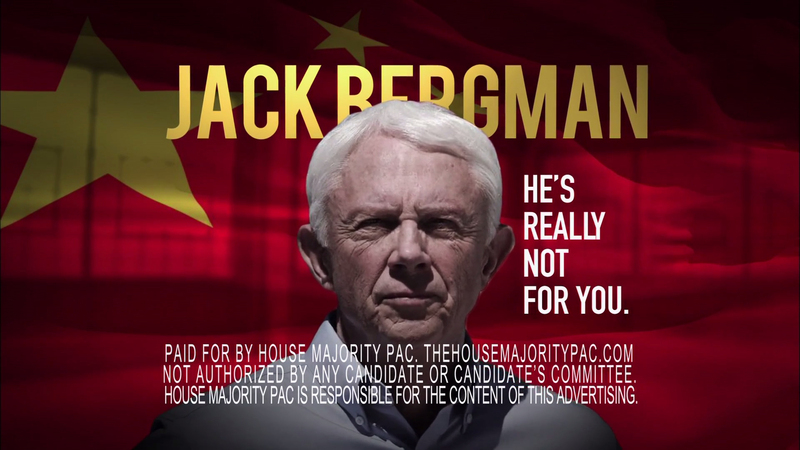 House Majority PAC shameful in its advertising. Apparently misrepresenting a 40 year veteran and 3 star general in front of the communist Chinese flag to score cheap political points is not beneath the Democrats who think that Michigan’s first congressional district is up for grabs. Nancy Pelosi’s ‘house majority’ PAC leaves no dirty trick behind as it denigrates the integrity and character of a patriot and American hero in order to advance its own political operative in a place and district which he doesn’t belong. As veterans and veteran supports, we are offended to see Lt. General Jack Bergman (Ret. )’s picture put over a Chinese flag in a recent negative political advertisement. Politics aside, General Bergman is a combat veteran and a three star Marine General. He spent over 40 years defending our nation and has worked to preserve freedom and democracy across the world. He has served our country honorably and should never be portrayed in front of a communist country’s flag. Lon Johnson has never served. He has never answered the call to duty. He does not understand the sacrifices that those who have served in our military make on behalf of our country. Lon Johnson’s dirty, negative campaign is offensive to the honor and heritage of our veterans community. Mr. Johnson should apologize immediately for this offensive advertisement. Politics is one thing, disrespecting those who have served and sacrificed for this great nation should be off limits. Very little is more offensive to our veterans’ community and our nation than plastering the image of a decorated combat General officer over a Chinese flag. This latest dirty trick highlights the choice we have this election. Lon is proving himself more and more to be a political operative, who continually resorts to dirty campaign tactics. We, as veterans and veteran supporters active in the First District, demand Lon Johnson, and the DCCC, and the House Majority PAC apologize for this distasteful and dishonoring political ad. Call Pelosi’s office @ (202) 225-4965 and demand an apology. I'm honored to know several signatories on this letter. Thank you for your service.